Have you ever pictured words coming out of your mouth, and seeing them in their true light for the first time you wish you could grab them and stuff them back where they came from, before they find themselves to anyone else? We had a bit of an experience with that this past weekend. We were out for a family dinner celebrating the life of a favourite aunt who had passed a week or so before, finally free from the ravages of cancer. At one point the discussion turned to an ex-partner of the aunt that she ended up leaving because he didn’t treat her that well. One of the party reacted with our aunt’s final nickname for the man that wasn’t complimentary. As the words came out you could see the attempt to grab them before they manifested themselves and smother them out of existence. We know this isn’t possible so they landed with impact amongst the family, which triggered a reaction from another member of the group. So at the end of an otherwise nice evening, we left the restaurant with fewer good tidings than we would have liked. Reactions are like that. They are intended to maintain the status quo. Sometimes a fast reaction saves the day. When we drop something breakable, fast reflexes allow us to catch the object before it hits the floor. Grabbing our child before they step off the curb can avert disaster. Words aren’t always like that, and there often isn’t that lightning fast need for them to leave us. But often they are on their way to quickly. Is that true for me? What’ is really happening here? Is this something that concerns me? Does that truly express what I believe? Then after asking ourselves these questions (you would be amazed how fast you can process these questions!) what would happen next if we simply quashed the reaction and replaced it with a well-considered response? By this definition, this means that a response would be less concerned with the status quo, and more open to possibility. It becomes an opportunity to ask questions instead of assert opinions, to invite others participation in the discussion and to collaborate on outcomes. Just writing those words I feel more at ease and imbued with positive intent! As leaders, there are so many opportunities to react. Our days are busy, people ask for help, problems appear at inconvenient times, customers needs something, etc. We can either allow our innate skills to jump into “fix it” mode, blurt out instructions, react such that others worry, and many other types of reactions. Is this our item to address? The first three questions again really help us quell reactions and put ourselves in a position to respond thoughtfully to a situation. By doing so we offer stability, calm, wisdom, and confidence that any issue can be addressed. I think the last two questions are really important leadership questions. They are really designed to cause us to create and hold and environment of coaching and mentorship. A space where individuals feel comfortable coming to solve their own problems. One where our experience and wisdom is offered in the form of questions and encouragement for others to explore their own knowledge, skills and experience and therefore grow as a result. My challenge to myself for 2013 has been to ask more questions. And the only way I can do that is to think fast! Both to interrupt reactions so I can create an environment to explore possibilities, but also to be present in each conversation so I can ask good questions to bring these possibilities to the forefront. How about you? 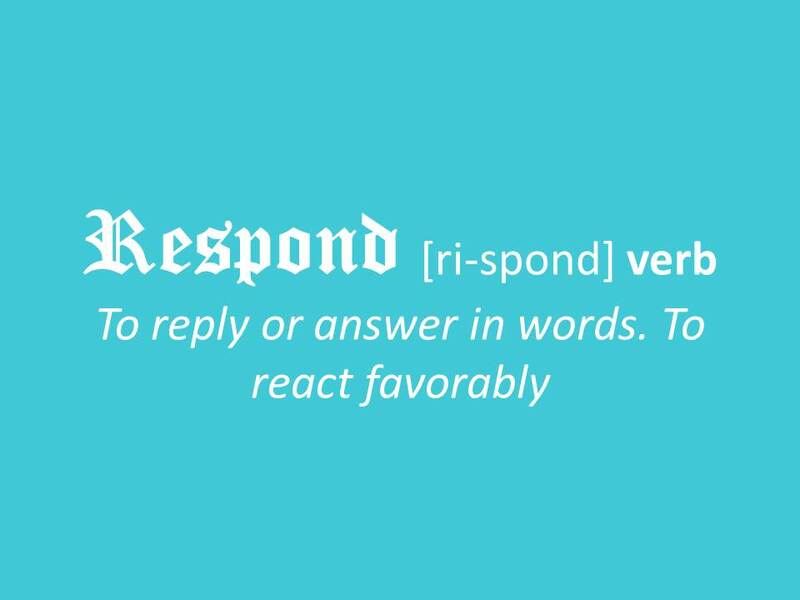 What are your thoughts on reacting vs. responding? How does this concept manifest in your life? The concept that one can always pause before responding is one habit worth mastering. I like your filter questions, especially ‘does that truly express what I believe?’. Too often I think we get overrun with feelings and forget about our true beliefs underneath. Yet, to live truly by your beliefs and respond upon them turns an effective leader into a great one. Hi Elizabeth. I do believe you have cut to the hear of the matter. The pause is the key. It does two things. It stops us from blurting out something we might regret and it allows our mind to access all of us including our heart, to make sure we respond in a way that is fully aligned with who we are. as my friend Brian Willis of Winning Mind Training reminds me to ask, “WIN” What’s important now? Thanks Louise! I love it when people leave me something to steal! These acronyms are great! What can also apply to this is the idea of knee-jerk reactions. For example someone comes out with a less than complimentary statement and your first thought is to react instantly and that you don’t think of what you’re saying. Pretty soon the discussion becomes a full out argument that probably didn’t need to as either party didn’t apply the WAIT thing Louise is talking about. Later we think of the I should have either said this or just kept my mouth shut. All we are left with is regret. Ian knows what I am talking about as the subject came up in conversation the other day. I love the thread of this discussion. The WAIT question is certainly relevant here as well I would look back a few weeks to Andrew’s comment regarding the word regret and how he wished we didn’t have such a word. Regret masks our capacity to learn by simply allowing us to wish it were not so. Hi Ian, a very thoughtful piece. 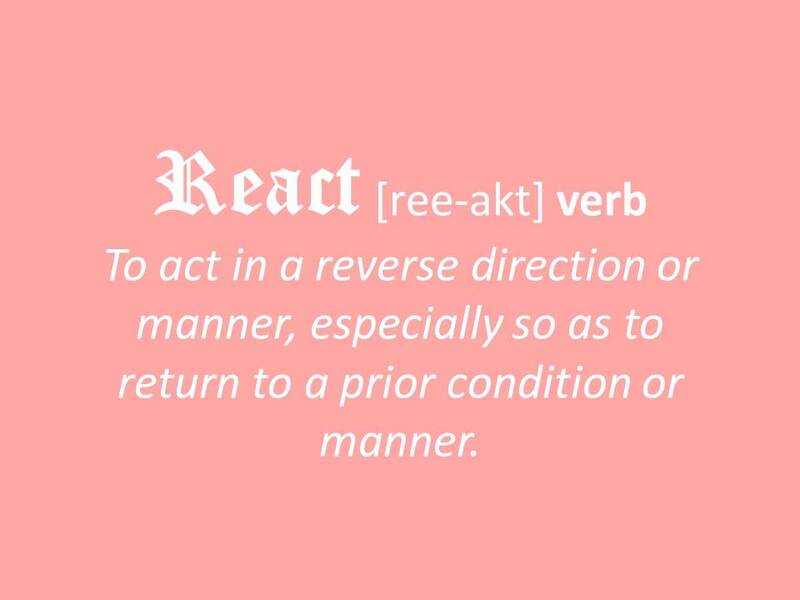 I think my natural tendancy is to react and I did this a lot when I was younger. I have learned to pause and ask myself will what I am about to do or say build someone up or tear them down? And sometimes not saying anything is the right thing for me to do. I love the questions that you chose: they are concise, powerful and simply put. Even when we do slip up and blurt things out (I still do this sometimes), do you think these moments can be salvaged by reaching out, apologizing and building stronger bonds in our relationships? Great questions Diana. I absolutely know that anything we say can be taken off the table as long as when we do notice that we have reacted we act with compassion when we move to withdraw our comments.